We find ourselves moving about inside all kinds of information bubbles, some good and some incredibly confining. When things are working well our friends, family, our social media feeds give us just the right amount of information that we need. But other times and this is especially true in terms of parenting advice, the saturation point can quickly overwhelm and confuse. As a teacher at a parent cooperative school, I witness the pressures of this bubble existence every day since I work and teach alongside parents. It is because of this partnership that I found this book helpful from two perspectives. To begin, I can see that it would be incredibly helpful for every parent to read this book. And then from purely a teacher’s perspective it gives me a very clear systems check to make sure I am not adding to the constant onslaught of pressure the parents feel. How calming it is to read the latest book by Stephen Camarata, PhD entitled, The Intuitive Parent; Why the Best Thing for Your Child is You, 2015. This book was so refreshing in its reassurances and straightforward insight into the research. The message is that “You have it in you.” This is supported and balanced by his review of the literature which hashes out the overlapping and often contradicting bits of advice that we all have thrown at us each day as we work to raise happy children. It is so hard to separate the well-meaning advice, the relevant research, and the alarm bells as we look at the very precious being we hope to send off into the world. Dr. Camarata weeds through all that and cuts to the chase — that is how I felt as I read the book. I especially recommend this book for parents of school-age children. There is so much thrown at us beginning in early childhood placements. One of the discussions that I really appreciated as a teacher is about developmental milestones and stages. It is important to remind ourselves that these milestones are not chronological and as ordered as a checklist would imply. I find that milestone checklists never really tell the full story of a child’s experience. Once a parent told me that our local schools send a very clear message that our children should be good at everything. In this she meant that there every child is expected to be good at every subject at the very moment the school chooses to test him or her on it. Then, the message continues, the child will succeed, in life, in school, in future work — quite a tall order to place on the shoulders of a 7 or 8-year old! Meeting this lofty goal of “good at everything” leaves struggle for both child and parent. Both parent and child work from a place of perceived failure. 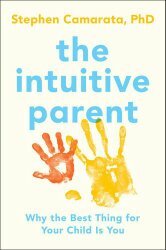 The Intuitive Parent provides us with ideas about both why this is happening in the schools and why we are trapped in that kind of thinking. Then, and this is the best part, Dr. Camarata provides guidance to the parents, not just reassurances and platitudes. I am hoping to use this book as a book club book for our Saturday morning coffees at our school. What a great learning opportunity for teachers and parents to share this book!